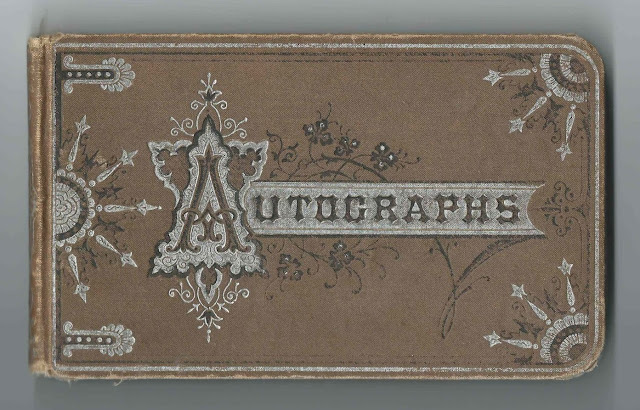 1879-1884 autograph album of Harriet Maria Tompkins, "Hattie", of Bridgewater, New York, with many pages inscribed by her fellow students at Hamilton Union School at Hamilton, New York. The album measures 7" x 4-1/4" and contains the sentiments of over 100 of Hattie's relatives, friends and schoolmates. An alphabetical surname list and an alphabetical list of the signers, together with any personal information they offered, appear at the end of this post. Harriet Maria Tompkins, "Hattie", was born 28 January 1866 in New York, the daughter of James H. Tompkins and Mary Frances (Southworth) Tompkins, who were born at Marshall, New York, and Bridgewater, New York, respectively. Hattie's parents signed facing pages in her album. Hattie attended Hamilton Union School, perhaps in the Class of 1883, at Hamilton, New York. Many of her fellow students signed pages in her album, including this group page, which contains the autographs of Class of 1883 students Frankie Rhodes; Lena T. Rider; W. B. Woodman [William B. Boardman]; S. S. Woodman [Samuel S. Boardman]; Lena M. Reynolds; Ira Stradling; Mary Kennedy; Forbes M. Dodge; Minnie A. Etson; C. H. Squires; and P. J. Lyons. About 1898 Harriet Maria Tompkins married Charles Gallup Rising [Reising], son of Milo Moses Rising and Esther June (Gallup) Rising. Hattie and Charles settled at Bridgewater, New York, and had at least one child, a son Howard Tompkins Rising, born in 1899. Widowed Hattie was living with her son Howard and his family as late as 1940, according to the 1940 Census of Bridgewater, New York. If you have corrections and/or additions, or information on any of the signers listed below, please leave a comment or contact me directly. M. D. P., signed on September 14, 1879 Late note: "Died in Minneapolis April 2, 1885". She was Harriet Maria Tompkins' great aunt Maria Dennison (Southworth) Pendleton, a sister to Harriet's maternal grandfather John F. Southworth, and the wife of Oliver Pendleton. Linn Baker of Hamilton, New York; not sure of given name. Mate L. Bran of Munsonville, New York, signed at Hamilton, New York, on "12-4-1881" at Hamilton Union School. Sophy Forward of Bouckville, New York, signed at Hamilton, New York, on December 1, 1881. Class of '82, presumably at Hamilton Union School. Lida Gates, signed at Hamilton, New York, on December 5, 1881. Later note: "Married February 1885 to Walter Banning"
J. A. Goodier of Cedar Lake, New York, signed on December 18, 1880. Presumably Joseph Alonzo Goodier, husband of Caroline (Tompkins) Goodier, who signed the right facing page. Carrie T. Goodier, signed on December 18, 1880. Caroline (Tompkins) Goodier, whose husband Joseph Alonzo Goodier signed the left facing page. Mary C. Griffin of Bridgewater, New York, signed on July 19, 1881. Later note: "Married Sep. 1883 to Dr. Chas W. Kinney"
Gaylord Logan of Bridgewater, New York, signed on July 25, 1882. At the time of the 1870 Census, Gaylord was living with Harriet Maria Tompkins and her parents. P. J. Lyons of Hamilton, New York; not positive of first initial. J. B. Manchester of Madison, New York, "A Mistake, February 9, 1882"
Mamie Mosier, signed at Hamilton Union School on November 17, 1881. 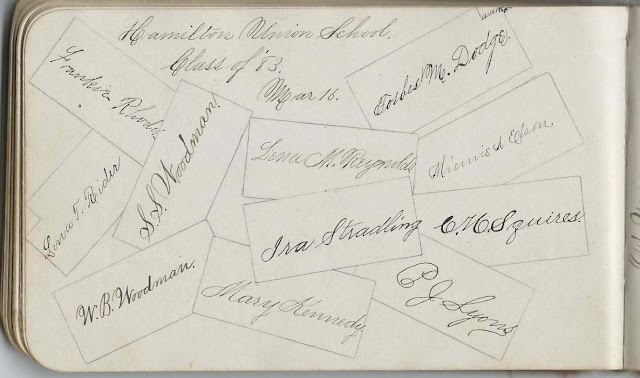 Etta J. Peckham, signed at Hamilton, New York, on November 17, 1881; Class of '82, presumably at Hamilton Union School. Lula L. Rice of Lebanon, New York, signed at Hamilton Union School on June 1, 1882. Later note: Mrs. Milton Woodman, 1885"
L. Roberts. Later note: "Mrs. John Turnbull"
Edith Southworth, signed on February 7, 1880; Harriet Maria Tompkins' cousin. Her parents were Mary Ann (Rhodes) Southworth and Henry Oswald Southworth, who was a brother to Harriet Maria Tompkins' maternal grandfather John F. Southworth. Mabel Southworth, signed at 28 West 20th Street, New York, on June 26, 1881; Harriet Maria Tompkins' cousin. Later note: Married Sep. 1, 1881, to Arthur Tooker. Mabel Augusta Southworth was the daughter of Henry Oswald Southworth and wife Mary Ann (Rhodes) Southworth. Henry was a brother to Harriet Maria Tompkins' maternal grandfather John F. Southworth. May L. Southworth of Wabasha, Minnesota, signed on April 9, 1883; "your cousin". Presumably Mary L. Southworth, daughter of Asahel Dimmick Southworth, a brother to Harriet Maria Tompkins' mother Mary Frances (Southworth) Tompkins. Nelson C. Squires of Hamilton, New York; schoolmate, presumably at Hamilton Union School. "Your fellow sufferer in Arithmetic"
Uncle Jedediah of Bridgewater, New York. He was Jedediah Tallman, husband of Aurelia Lucretia (Southworth) Tallman, who was a sister to John F. Southworth, Harriet's maternal grandfather. His wife Aurelia signed the right facing page. Aunt Aurelia of Bridgewater, New York. She was Aurelia Lucretia (Southworth) Tallman, a sister to Harriet Maria Tompkins' maternal grandfather John F. Southworth. Aurelia's husband, Jedediah Tallman, signed the left facing page. Harriet Maria Tompkins, album owner. J. H. Tompkins of Bridgewater, New York, signed on January 1, 1880. James H. Tompkins, Harriet's father. His wife Mary Frances (Southworth) Tompkins signed the right facing page. Mary F. Tompkins, signed at Christmas in 1879. Harriet's mother, Mary Frances (Southworth) Tompkins, whose husband James H. Tompkins signed the left facing page. Jane L. Tompkins, signed on July 8, 1881; Harriet Maria Tompkins' aunt Jane L., married to Nathaniel Tompkins, a brother to James H. Tompkins, Harriet Maria Tompkins' father. 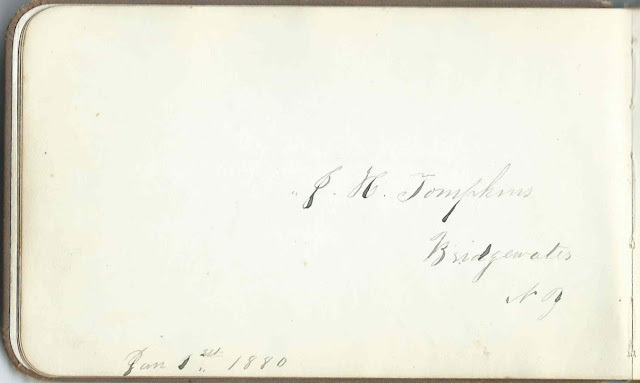 Dora Tompkins, signed on July 5, 1881; "your cousin"
N. H. Tompkins of Lowell, New York, signed on January 1, 1880. Presumably Nathaniel H. Tompkins, brother of Harriet Maria Tompkins' father James H. Tompkins. M. Alice Warren of Springfield, Vermont, signed on "8-1-1879". Later note: "Married Sep. 2, 1885 to Frank Smith, M.D."